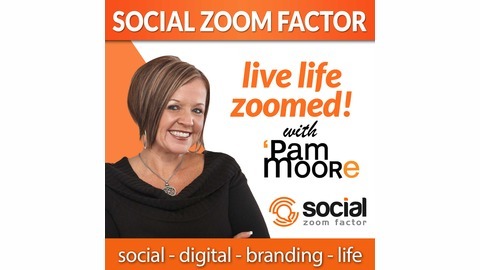 SocialZoomFactor is a social media marketing, branding, business and lifestyle podcast created for you, the business and marketing leader in startups to enterprise organizations. 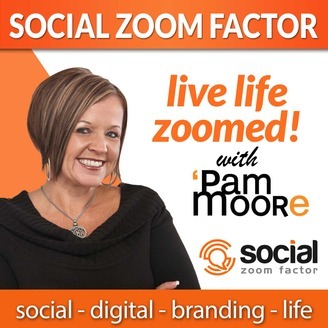 If you want to learn how to integrate social media, branding, digital marketing, visual marketing, content marketing and the latest technology and new media to zoom results in business and life you won't be disappointed in the energy and information Pam Moore delivers 1-2 days a week. Each episode brings you actionable tactics and strategies you can implement today for real business results. Pam is CEO / founder Marketing Nutz and ranked as Top 10 Social Media Power Influencer by Forbes. What Makes an Event or Conference Amazing? Today we are talking about another exiting topic... events. Who doesn’t love an amazing industry event where you get massive value, make new friends, and connections that help grow your business and of course have fun. A good event is all about the experience which is driven by the founders and organizers. They can either make or break and event. Having a heart to serve with a number one goal of making the event the highest value possible for attendees is the turbo behind the most successful events I have seen. Today I have two amazing guests who are going to share with you some of the exact strategies they have leveraged to build and grow the Midwest Digital Marketing Conference (aka MDMC) into the largest digital marketing conference in the Midwest. I spoke at the event in 2018 and will be the emcee hosting the event this year as well as delivering a 2.5 hour personal branding workshop and facilitating a personal branding panel. What started as a tiny seed of an idea for an event was recently rated a top marketing conference to check out in 2019 by Forbes. If you know me, you know how much I love seeing seeds planted by amazing people and watching them grow and bloom! In 2018 MDMC had 2000 marketers in attendance and 2019 is looking even more exciting. MDMC will have more than 100 speakers including Google, LinkedIn, GoDaddy, Johnson & Johnson, Adobe, Purina nd more. Attendees get to choose from more than 70 sessions across 9 tracks including data, digital, social media, creative, commerce, innovation, academic, tech and entrepreneurship. Marketers can also take a deep dive into 8 intensive workshops of which one I am teaching on personal branding. Tickets are affordable so that everyone can attend, and bring their entire marketing team so they can maximize the value. MDMC is a nonprofit event and all proceeds go to MDMC Marketing Scholarship Fund, an UMSL Undergraduate Marketing Scholarship made possible by the MDMC Let me welcome my 2 guests, Perry Drake, MDMC Founder and Assistant Professor and Executive Director of the Marketing and Sales Leadership Institute of the University of Missouri of St Louis. Second we have Brainna, Smith, Director of Digital Marketing at TeraRecon, Exec Director of MDMC and Adjunct Professor of Social Media Strategies and advanced Facebook Advertising at the University of Missouri St Louis Grab Your Ticket!